We're already in line for today's back-to-back CES 2008 press conference marathon. 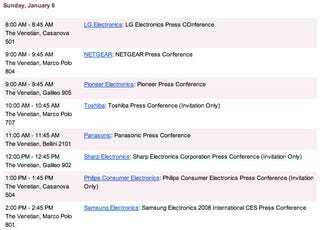 First up, LG Electronics followed by Pioneer, Toshiba, Panasonic, Sharp and Philips—and that's all before lunch. Stay tuned for liveblog updates throughout the day.